The powerful surge of hair cutting and hair coloring mega trend of PURE shades, METALLIC shades and the craving of GRAY/SILVERS. This sophisticated approach of classic shapes and shades , reinvented with a twist , is what brings this collection to life. The fashion duality of leather, oxidized metals and floating layers, form and fit each look perfectly. The iridescent tones emphasizing the geometrics of the shapes, provide lights and shadows with reflective and opaque saturations. Each translate their feminine strength as warriors of their own worlds. Wearing the look they desire and living the life they choose without boundaries. Foundations are necessity to push creativity! This collection takes past moods from the 50's,60's,70's,80's,90's into now… The familiar shapes of the time while adding a new vivid play of color. Whats new is re invented diffusion of decades past! We had a lot of fun on this impromptu shoot , so we wanted to share it with you! “Before becoming a hairstylist, I studied art extensively, and I wanted to show how art values and theories can easily be adapted to hair. Traditionally, hair color lines are placed and approached horizontally, diagonally, or vertically. With this look, it was about placing on the abstract. Going above “Color Melting” or Color Blocking”, this technique is about freeing up the boundaries while still having a skillful hand. I also wanted to create an awareness of which shades can sit beside each other. By placing the right tones/shades together you can achieve beautiful blends of secondary and tertiary shades for an amazing end result. Creativity and Collaboration are essentials to grow as artists and designers. This collection was a beginning for us as CoCre8. Pushing each other and our approach to create a spectacular end result. Enhanced naturals, soft finishes and the start of a powerful future. This fashion collection embodies the trend relevant iridescent and pastels palettes and placing them in a neutral saturated background. 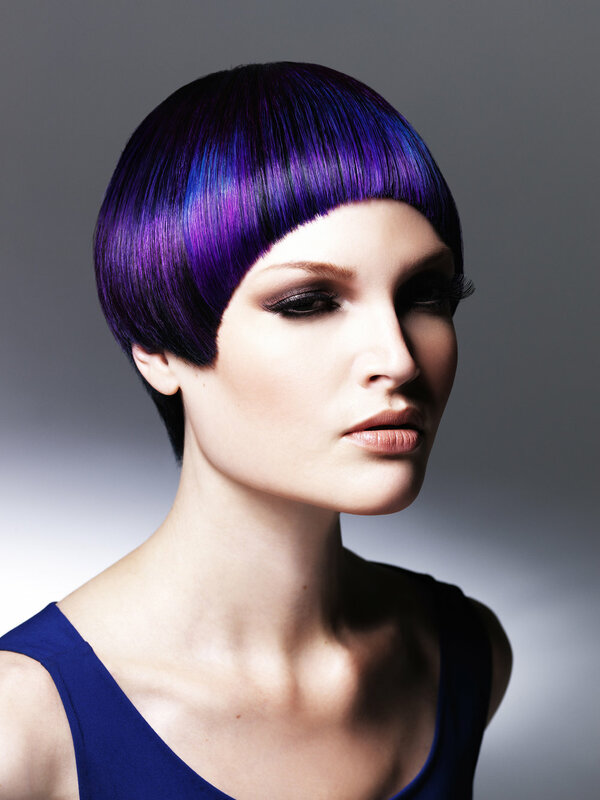 These modern combinations within the hair cuts and styles provide a fresh and edgy spin to the classics. We together as CoCre8 Education have been on a combined personal journey of discovery and growth over the past 18 months. When life as you know it goes through external disruption, you learn to seek guidance from wherever or whatever fits within your spiritual self and beliefs. We have by chance come across the power of healing crystals. Each one that you are attracted to, opens up a different energy that supports you and your spirits needs. With this being a positive part of our culture, we are also visually attracted to the iridescent glow that each individual crystal has and the creative color combinations created by nature. This was our inspiration and influence for the “Melted Crystal” Collection. Looking at the tonality and blends from dark shades to almost transparent, and the interplay of color patterns along with unique color combinations. The interplay of cool tones such as green being present in a warm or pink foundation. Or the discovery of warm orange tones , found in a deep violet base. 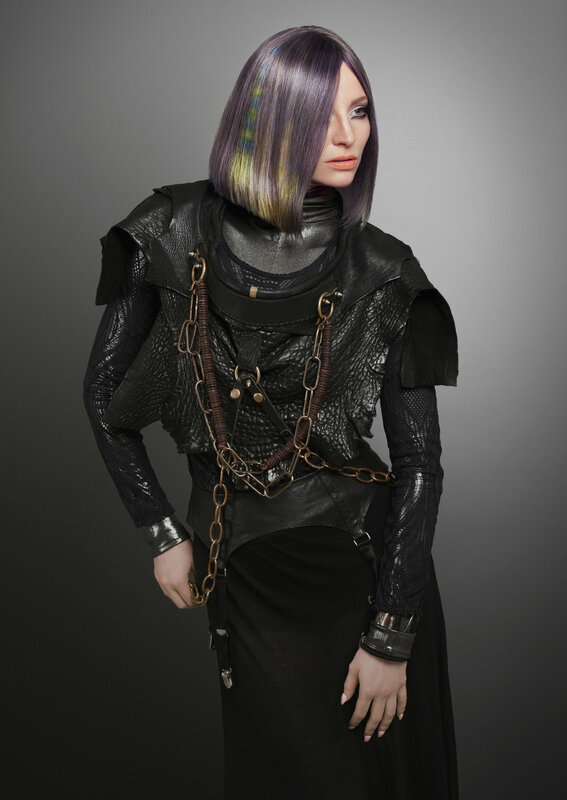 The visual foundation of our color palettes were created by taking the intriguing elements and re creating the illusion on the hair as our canvas. 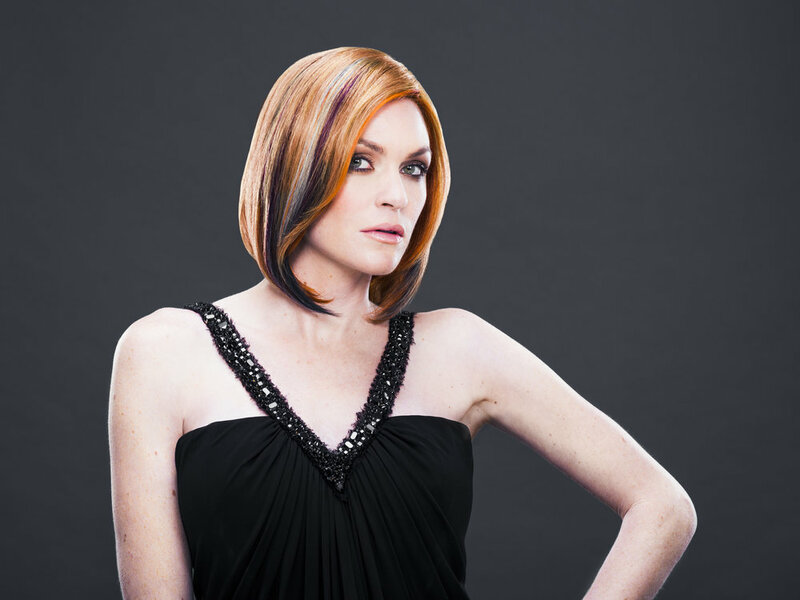 This CoCre8 Collection, is supported by L’ANZA HEALING HAIR COLOR and VIBES Direct Dyes. The “COLOR MELTING” of the hair color technique is LIFTING each model to the appropriate lightness, and then choosing your pastels and pure’s with different amounts of dilution for each.look This collection is about hair color discipline and creativity combined as you approach your hair color. The CoCre8 styling is supported by our CoCre8 Interchangeable Styling Kit.